MGM Resorts International is reinforcing the company’s commitment to healthy living with the addition of Smart Plate®, a new program providing guests and visitors delicious and healthy menu items at 700 calories or less per dish. 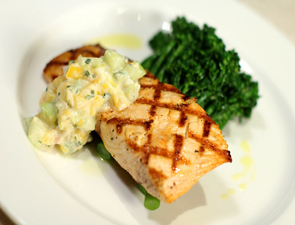 The exclusive calorie-conscious items are available on select in-room dining menus and at participating cafes. Smart Plate selections, designated on menus with a specialized logo, will be updated frequently, offering guests new choices throughout the year. Executive Chef J.L. Carrera of Morels French Steakhouse & Bistro at The Palazzo has created a $49 three-course steak menu that will run through Dec. 24. The menu consists of choice of soup of the day or Boggiato Farms baby iceberg with house dried cherry tomatoes, spring red onion, applewood smoked bacon and Bleu D’auvergne dressing; a 14-ounce grilled New York sirloin with pesto pommes puree and bordelaise sauce; and mixed berry crumble dessert with blackberries, blueberries, strawberries and raspberries, served with vanilla ice cream. 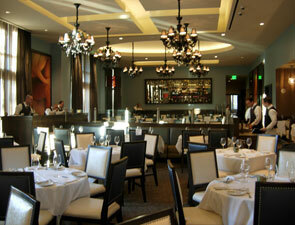 Named one of the Strip’s best steakhouses by USA Today’s 10best.com and recipient of Wine Spectator’s “Best of Award of Excellence,” Morels French Steakhouse & Bistro merges a classic steakhouse with unique culinary aspects, including an iced seafood bar and a cheese and charcuterie bar with more than 60 farmhouse and artisanal cheeses with handmade salamis and meats. Morels French Steakhouse & Bistro is located in the main lobby of The Palazzo and open Monday through Thursday 8 a.m. - 11 p.m., Friday and Saturday 8 a.m. - 12 a.m. and Sunday 8 a.m. - 10 p.m. Brunch is served Saturday and Sunday 8 a.m. - 4 p.m. For reservations, please call 702.607.6333 or visit morelslv.com. 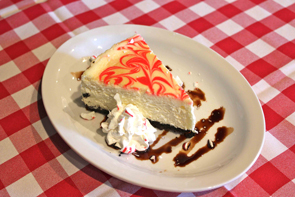 Grimaldi’s Pizzeria, famous for its award-winning, hand-tossed, coal-fired brick oven pizzas and calzones, continues its winter cheesecake lineup with flavors that are sure to tickle your taste buds: Peppermint Cheesecake and Butterscotch Toffee Cheesecake. Taste the holidays with Peppermint Cheesecake, a winter cheesecake made with an Oreo cookie pie crust and garnished with whipped cream and chocolate sauce. The Peppermint Cheesecake is available at all Grimaldi’s Pizzeria locations and will replace the Pumpkin Cheesecake starting Sunday, Dec. 1. Grimaldi’s cheesecakes are prepared fresh daily and priced at $5 per slice. Grimaldi’s Pizzeria also serves up Butterscotch Toffee Cheesecake made with an Oreo cookie and toffee crust and topped with whipped cream and chunks of Heath bar. During the winter season a new flavor will be featured each month, although guests can spoil themselves with the Butterscotch Toffee Cheesecake through the end of January. Grimaldi’s Pizzeria will continue to offer its traditional dessert menu for guests to choose from which includes: Tiramisu, Housemade Cheesecakes-New York Style or Oreo Cookie-priced at $5 per slice and Grimaldi’s Famous Cannoli for $4.50.